Stanford as far as the crow flies is not far from Cape Town. But there can be the odd occasion when, by the time you reach there, after having battled the numerous sets of lights through Somerset West, you feel slightly as though you’ve been through a mangler. 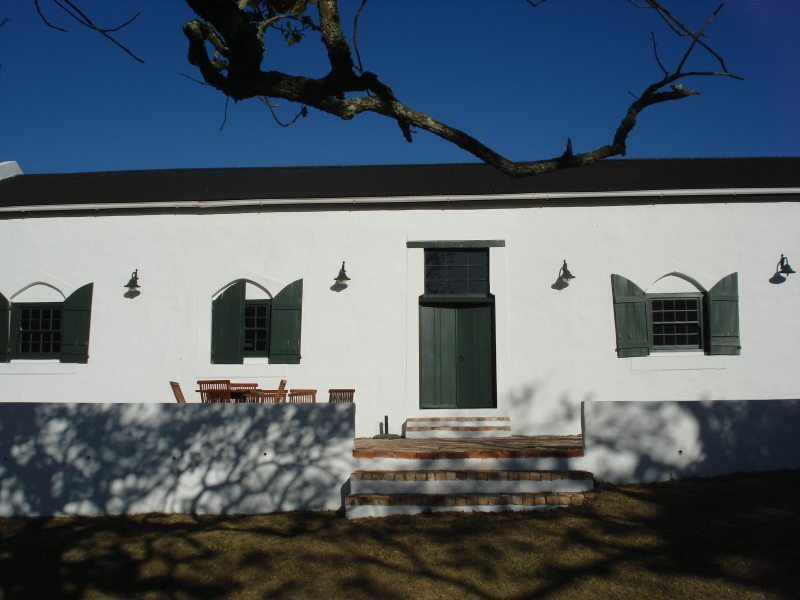 Which is even more reason why, in the shadow of the Akkedisberg Mountains in a valley through which the Klein River flows, a stay in Stanford Valley can feel a little like coming home. The Overberg is quite the most beautiful part of the Western Cape. With its rolling wheat fields, sheep and beef farms, gorgeous mountains, seaside and riverside villages, and swathes of sumptuous scenery, one is easily enraptured. 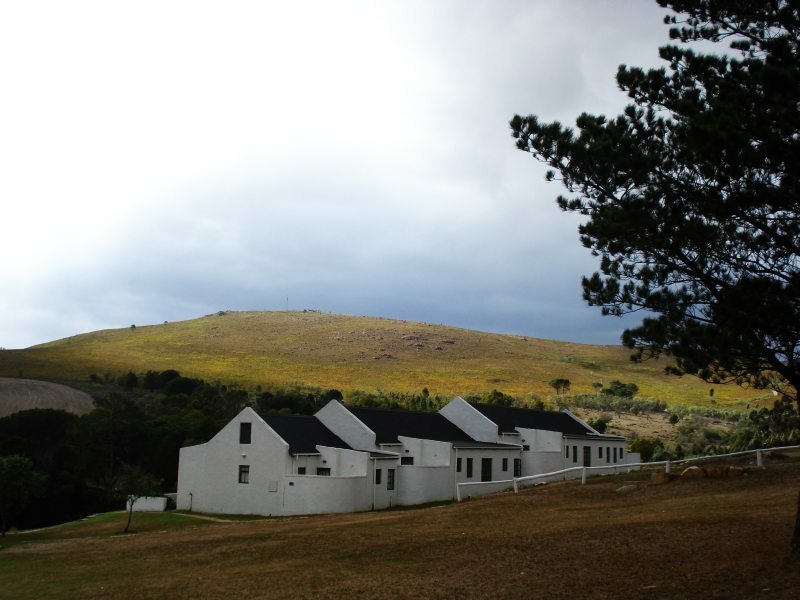 Stanford Valley, despite sounding like a valley in which the town of Stanford lies, is infact a beautiful organic farm, which also offers a guest farm and retreat centre, roughly 10 kilometres outside of Stanford on the R320. It’s position is breathtaking and the mostly restored buildings and outbuildings incredibly pretty. Loaded awkwardly with some of our baggage (why, oh why do we always pack as though venturing forth for a month when only away for 10 days!) I stumble over a little piece of fluff that I just manage to see out of the corner of my eye. Apple, one of two resident husky puppies (the other is aptly named ‘Tiser as in appletiser – get it? ), just misses feeling the edge of my boot on his paw as I make my way to our cottage. 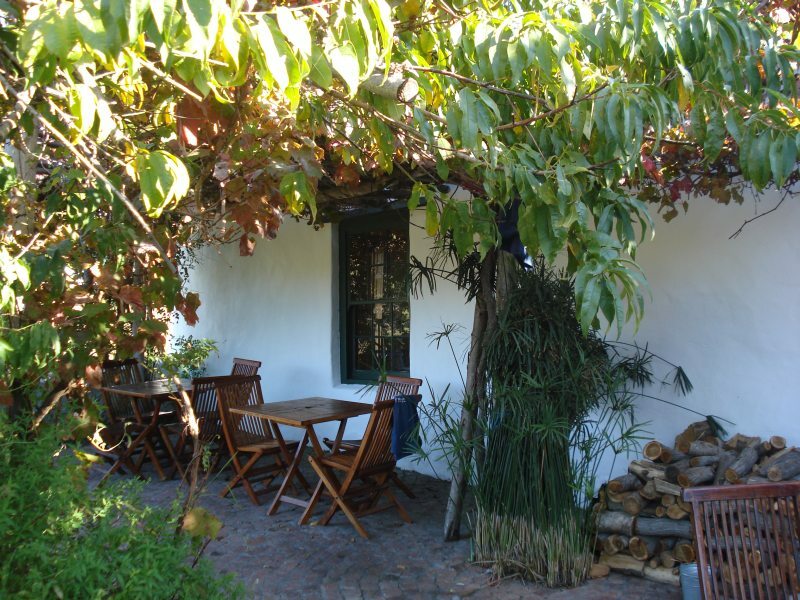 Our cottage is small, but homely and thoughtfully decorated, complete with stoep and gardens, although the scorching summer sun and lack of water in the area has put paid to any of the grass that was here, and even some of the fynbos appears to have suffered. Certainly the Cape gooseberry bush just outside our door has seen better days. Whilst we offload, a series of piglets and their positively bossy mothers come snorting by, although they give us a wide berth. And on the other side of the barn we spy an entire coup of bustling hens, where the farm manager’s son, Sebastian, goes on daily forays for eggs, which you can buy along with raw honey from the Manor House. There’s a batchelor party on the go on the farm as well that night, but apart from watching them pretend to play some sort of ball game, after a fair number of drinks judging from the upended beer bottles in the bin outside the conference centre where they’ve based themselves for meals, we hardly hear them – the space is big enough not to fall over one another. And our hosts have placed us far enough away from them not to be affected, which is something of a relief as I hate having to gear myself up for a whinge session. Stanford Valley has an interesting history. 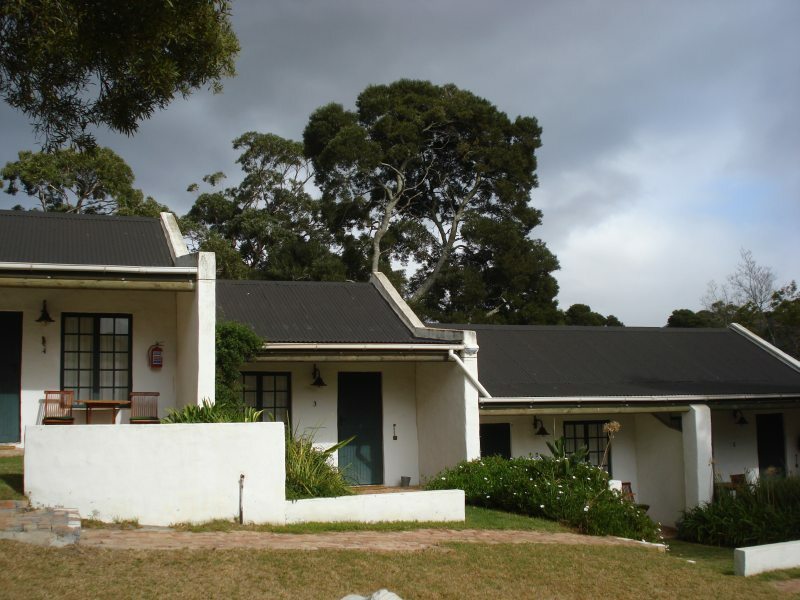 The 440 hectare farm was originally founded by 9 members, but soon increased to a group of 46 friends who have invested in the farm – it was something of a dream for the like-minded group to form a sustainable and environmentally friendly space where other like-minded people could come and stay. Out of this came the ‘future thinking and sustainability festival’ known as Freewheeling, which is due to celebrate it’s fourth year in October this year. I’ve missed the festival three years in a row now. But it sounds incredibly exciting. It’s something of a meeting place (you can stay in the cottages or camp in a site just across the river on the farm – complete with eco showers and compost loos, if that’s your kind of thing) to explore post-carbon and green issues, renewables, land and agriculture, education economics, wellness and personal developments, arts and culture and community development. All round, it’s one of few places to meet fellow greenies, economists, artists and thinkers and find out what’s happening and what could still happen in South Africa, and infact the world. The farm grows wheat, oats and barley organically, which it sells to farmers in Caledon chiefly for feed (good to know that somewhere there are cows and sheep munching on organically grown products!). 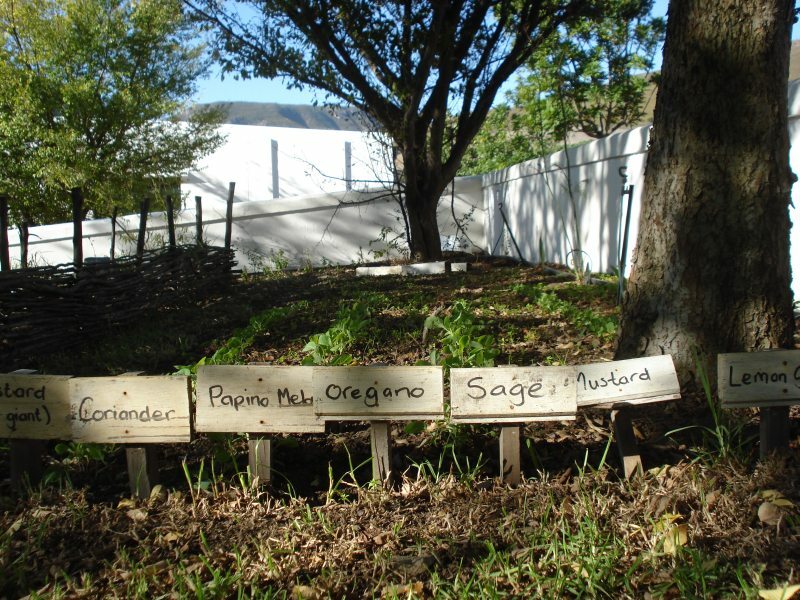 They’re also experimenting with organic rose geranium and lavender for essential oils, and their cattle, a friendly lot who maintain their distance with the aid of a couple of strategically placed fences, help restore the soil. The next morning is Easter Sunday and we’re up early to see what the Easter bunny has hidden for our son (one of us slips outside whilst we distract him with eggs inside). As usual it’s an overabundance of eggs and bunnies (that’s the last time I invite granny for Easter! ), and I’m forced to relocate some of them before my son begins displaying his newly acquired mathematical dexterity and counts them. Once that’s done, he’ll keep tabs on just what has moved from his basket, and by Christmas he won’t have any teeth left. 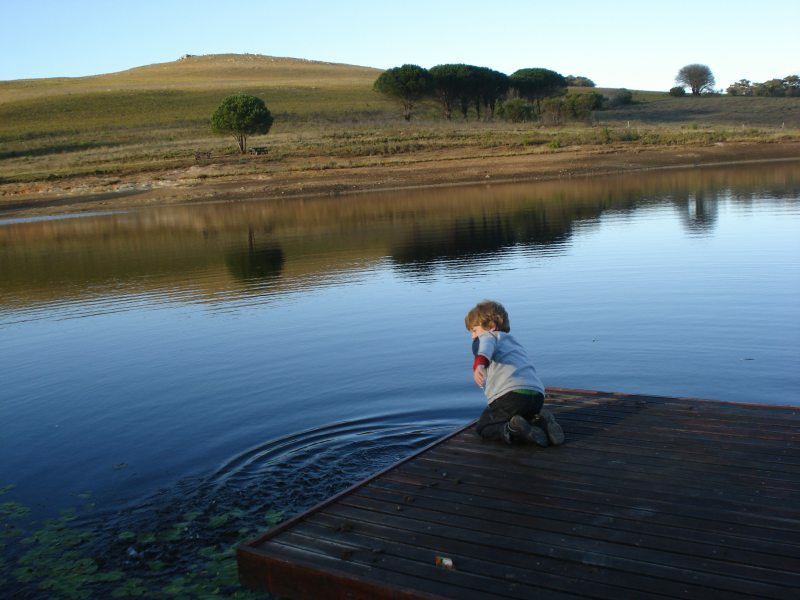 But early mornings are for exploring and the farm has a number of dams along the dirt road above our cottage. Whilst one of them is dry, the other has a breathtaking beauty in the early light of a new day. There is a simplicity at Stanford Valley that is hard to emulate. The mountains are virtually close enough to touch, the trees along the banks of the now dry river rustle gently in the wind, a constant reassuring voice, and there are the call of birds I’ve never heard. Water on the farm comes from a mountain spring at the back of the farm that feeds the dams, and which does not need the assistance of chemicals, thankfully, for use on the farm or for drinking. Whilst there we have a look around the conference area. It’s been given four stars by the Tourism Grading Council and is quite an impressive space with a main conference room that can divide into two, and the usual required paraphenalia (TV etc.). And the catering section too is wonderfully decorated and able to take large groups at a time. And all of this in a thatched roofed, white walled historical building. I can see the attraction. Nick, his partner Juanita and his mother Cathy now manage the farm and the guest farm. They’re still finding their feet but they chat to me about the upgrade they intend making after Easter, to spruce things up a bit in the cottages. Whilst we chat, ‘Tiser continues to nip Apple’s ears until I’m tempted to pick up the smaller of the two to defend her from his antics. They barrel over the vegetable garden, which remains remarkably unscathed, considering. Our three days pass too quickly. But not before we’ve sampled the eggs and bought some raw honey – as scarce as hen’s teeth back in Cape Town.